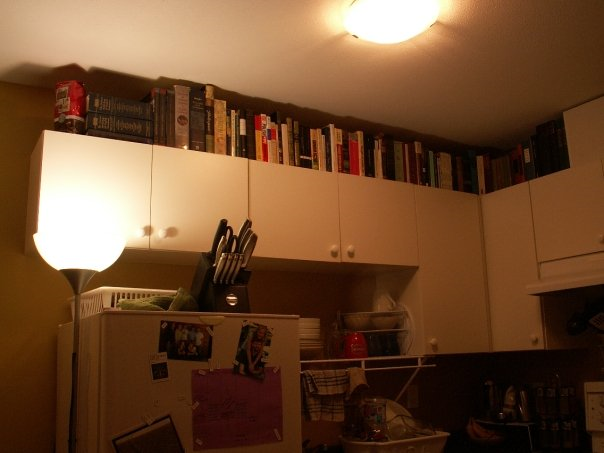 OR: How to fit a large number of books into a very small apartment. OR: My library – a visual tour. This post also responds to a question from Nick. My wife and I don’t have the biggest apartment in the world. Its probably our second smallest. Thankfully, unlike out last place in Dallas, we’re not in a studio any more. This is the only bookshelf that was actually in the apartment when we arrived. Its not big, but it did fit all of our language books on it. 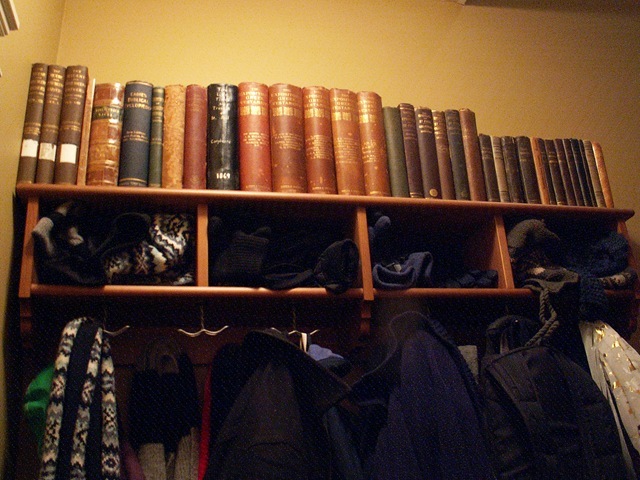 The top shelf has Greek and Latin texts and textual criticism. Some might thinks it a little over the top to own five copies of the Greek New Testament, but only two of them are identical texts and one of those two is my wife’s Greek-Latin Diglot. That’s right. My wife knows both Greek and Latin. The middle shelf has the grammars. Last year I printed Funk’s grammar off the internet. Its definitely worth having in print. Beside it is Dr. Decker’s Greek reader. Then LaSor, Wallace, Anne Groton’s Classical Grammar, Zerwick, Machen, Goodwin, a grammar by W. Bell from 1821, Discontinuous Syntax (that I’m bloggin through), Campbell’s new book on aspect, Campbell’s 2007 book on aspect, Wong on Semantic Case Relations, McKay on Aspect, and Porter on Aspect. Then comes the Latin grammars, which are mostly my wife’s and I don’t know them as well. I’m planning on opening them up at some point. 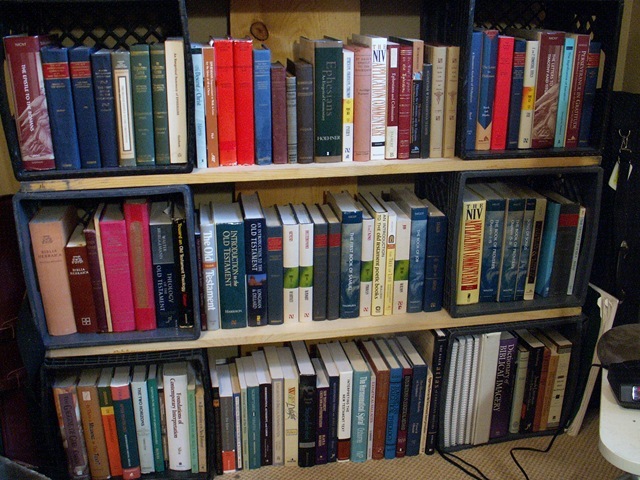 The bottom shelf claims to be lexical, but some how How Biblical Languages Work got in there. Then we have Deissmann’s Bible Studies, Lee’s History of New Testament Lexicography, Silva’s Biblical Words and Their Meaning, Louw & Nida, Thayer (yes, it does still have value), a reprint of a 1800’s analytical lexicon that I haven’t used since college, Danker’s Shorter Lexicon, BADG (2ed), and NIDNT. This is my travel shelf. Milk crates and boards. My wife and I have lived in four places in the past 18 months and this is the most practical way to always have shelving. Now I repeated the middle shelf, but from top to bottom: books I’m reading/can’t fit else where, Monographs and commentaries from Matthew through Romans (Cranfield), Romans (Moo) through 1-3 John by Marshall. I don’t have print books covering the NT or OT. Note the middle of the middle shelf is nearly all on Ephesians. 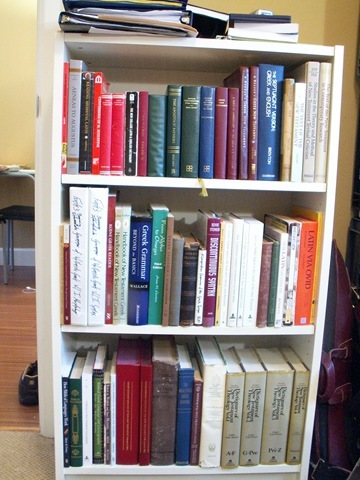 Of particular note is the small brown book directly to the right of Harold Hoehner’s giant tome. That’s an 1856 first edition of Charles Hodge’s commentary on Ephesians. 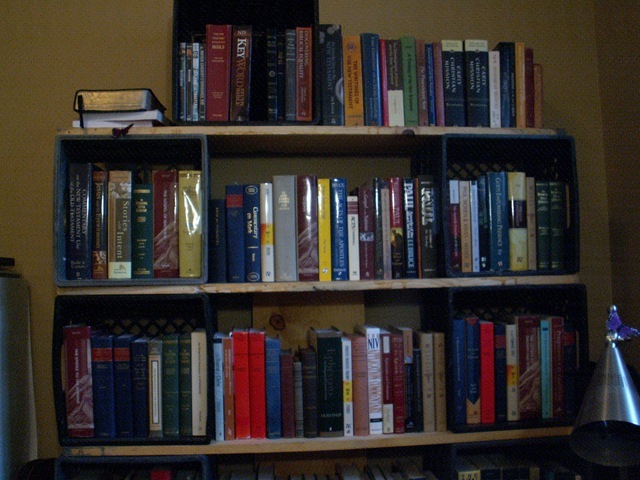 Finally the bottom two shelves are Old Testament and then hermeneutics. The spiral notebooks are a prepub version of Dr. Bateman’s Workbook for Intermediate Greek. 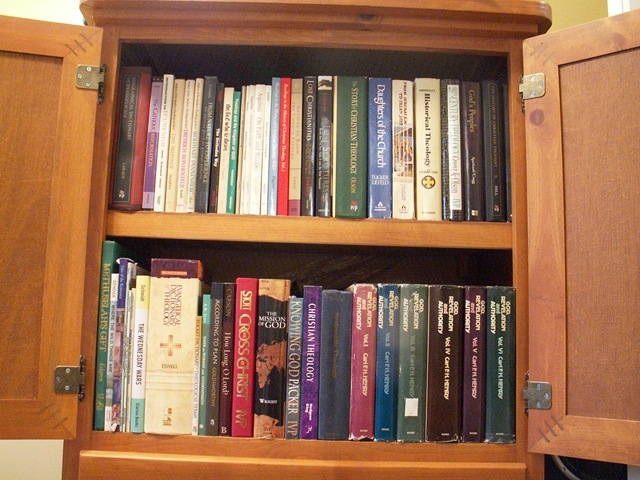 Beside them are a few more random books, Dead sea scrolls, Jewish Lit Between the Bible and the Mishnah…etc. This is my meager (Biblical) theology & children’s literature collection. Its not much, but I’ve read them all – well, I’m still working on Carl Henry. But this is our most creative endeavor. English & world literature and literary criticism above the kitchen cabinets with a pound of Starbucks Verona Blend on the left. In a way this might be more creative – in that I built it myself. Its crooked and ugly, but it holds books. Actually its made completely from poorly cut scrap wood I picked up from a theater guild at the end of their play season. I didn’t have too much say it how well it would turn out because of that. Anyway, it holds linguistics books. This is easily my favorite group of books, sitting on the coat hanger shelf in the front entry way. These are the oldies. My favorites are: Lightfoot’s commentaries, the Cambridge Greek Testament, Expositor’s Greek Testament, Alford’s Greek Testament on Paul’s letters, Gesenius-Kautsch-Cowley’s grammar, a one volume edition of Conybeare and Howson’s Life and Epistles of St. Paul (not the people’s edition), and a copy of Bibliotheca Sacra from 1856 – very interesting articles dealing with slavery in scripture. So there you go. There are also random books just lying around that someone is reading too, but…you don’t need to see those too. It was fun trying to find places for everything in a 350 sq foot apartment. Nick: That’s good to know. I might have to get a sixth one. I don’t have a copy of Westcott and Hort’s text. Esteban: I’m sure there are other random places that you could fill with books. I think the most ashamed of me my wife has ever been is when I rearranged my bookshelves canonically. I think it was one of those realizations for her that she is married to a geek. Well, that’s not horrible. I do that on a relatively regular basis. Pretty impressive for 350 sq ft! And a pretty good collection for the time you’ve had to work on it. (Do finish reading Henry! He’s a thoughtful and well-read theologian, esp. in regard to the issues of language and Scripture.) My collection isn’t nearly as creative in storage–just plain shelves–but then I don’t have to squeeze in a kitchen and bedroom! Apparently links aren’t allowed in posts, at least as I formatted it. I’ll try it differently here. You know, there’s a large empty space under the bathroom counter where a few boxes would fit well, but then we have discussed in the past how that kind of thing makes me, like, way nervous. Dr. Decker, your desk looks like my kitchen table – especially since my wife’s writing papers right now. And your office in general looks like my father’s. I cannot imagine moving with a library like that. Getting 500 books across the Rockies was hard enough! I’m just thankful to have things like WBC and NIGTC on my hard drive. Esteban, you know, I’m continually nervous about humidity from cooking at the stove. I check the book above it regularly to make sure they’re okay. Keeps the pics coming, and I enjoyed reading. Next week I’ll put up more of something else I do. 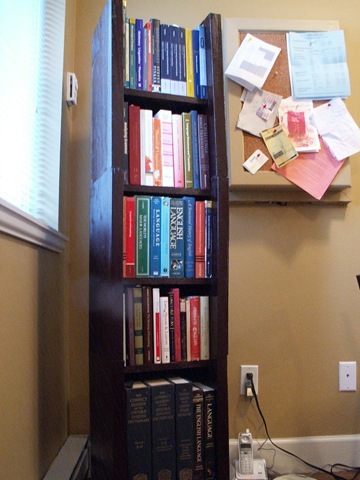 As the Good Book says, “Of the shelving of books there is no end”!